The Varomorus Propane Insect Fogger provides an efficient way to effectively treat for Varroa mites. It is well worth the investment. Beekeepers using foggers to apply oxalic acid in their beehives want the best in Varroa mite control. They want good equipment that meets varying specifications depending on individual beekeepers. The Varomorus Propane Insect Fogger promises an effective system for professional control of Varroa mites. It comes from a company with a number of products for beekeeping. Let’s check it out and see if it lives up to its promises. With this propane fogger, beekeepers are promised a quick application of oxalic acid. Varomorus says you can do it in 25 minutes. 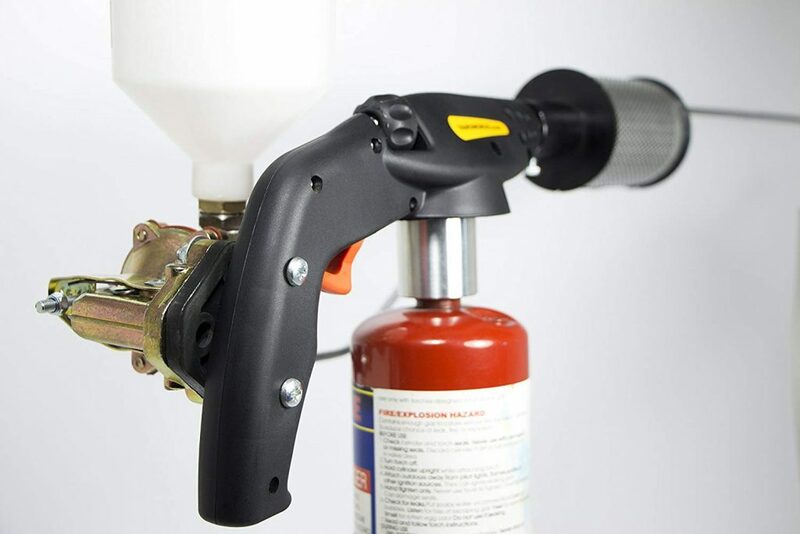 A number of features make this propane oxalic acid fogger stand out from others. Let us look at them among other evaluation points in this review. The fuel used in the Varomorus fogger is propane gas. It allows the fogger to heat up quickly. Additionally, propane burns in a very hot flame. It keeps the fogger constantly hot to heat up oxalic acid quickly. Varroa mite control is easy with the gravity fed design of the fogger. The Varomorus Propane Insect Fogger uses a design that allows easy flow and release of oxalic acid solution. It has a container big enough for acid that will last many hives before needing a refill. The fogger works great with a properly prepared oxalic acid solution. It gives a healthy puff of oxalic acid fog. The Varomorus Propane Insect Fogger is nicely sized for use. It is 470mm long and 150mm wide. Its height is 300mm only. It is also relatively light, even with a propane tank filled with oxalic acid solution. The fogger is great for professional application of oxalic acid. The fogger comes in two versions. One is adapted to use the European propane tank and the other takes an American propane tank. Beekeepers should get equipment that is usable in their region. Once hot, a small amount of propane is needed to maintain the high temperature needed in the fogger. A crack of the gas outlet is all you need. The oxalic acid fogger comes with an oxalic acid tank upon purchase. Beekeepers do not have to worry about this all-important part. Beekeepers have great control over the amount of oxalic acid solution that goes into the fogger coil area. A gravity-fed system is used in the fogger. This fogger works with ease and lasts for long. Used well, it gives you great value and becomes valuable hive management equipment. The fogger could do with a handle and grips. It may prove a little difficult to use for beginner beekeepers. Use both hands to operate the fogger for best results. One hand holds the fogger while the other operates the fogger. The trigger does not work the pump of this propane fogger. The Varomorus Propane Insect Fogger is practical and easy to use. It gets the trick done. It has great accessories in the market too. 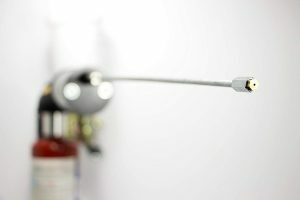 You can get a long extension rod for the fogger. An extension rod gives you a cooler fog burst and adds distance between the fogger and your beehive. The fogger is easy to use and very portable. It carries its energy fuel with it. This allows beekeepers using the propane fogger to treat even large apiaries faster than other oxalic acid application equipment. Fogging method of oxalic acid application delivers a large amount of heated oxalic acid treatment for Varroa mites. Treating mites with an oxalic fogger of this type is often done in a single release of oxalic fog into the hive. You should not blow too much oxalic acid into smaller hives. Bees get affected by over-application of oxalic acid. Proper use of the Varomorus Propane Insect Fogger gives you excellent control of Varroa mites. Keeping thefogger in good working order is very important. You should not dissemble the oxalic acid fogger if it is not necessary. To remove and prevent scale from forming in the fogger’s inner surfaces, use acetic solution. Periodically flushing acetic through the fogger keeps all acid solution and fog passages are clear. The filter of the fogger also needs periodic cleaning. If it gets clogged, the acid solution will not get through it. Beekeepers that follow these maintenance rules get great performance from the fogger every time. 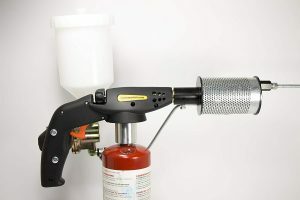 Using the Varomorus Propane Insect Fogger is faster than using a vaporizer to apply oxalic acid. It does not require cooling and then heating up again. Vaporizers consume time and make the process of treating more than one hive take longer. This fogger delivers a good puff of oxalic acid fog that distributes evenly throughout the hive. To complete beehive treatment with the fogger on time, make enough oxalic acid to treat many hives if you are working in a large apiary. For very large apiaries made of hundreds of beehives, you could prepare the solution twice or thrice. Stored oxalic acid mixtures lose strength after some time. If you ever run into trouble with the Varomorus fogger, there are great replacement parts to get it running again. Varomorus sells the replacement parts and they fit nicely onto the fogger. Make sure to get parts from Varomorus since they are durable and fit well. The company has great customer service ready to help beekeepers. 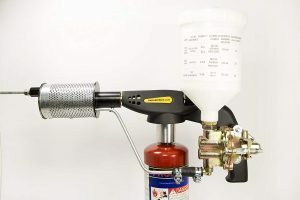 Instructions on how to use the propane fogger are included upon purchase. The well-detailed instructions make it possible for both newbie and pro beekeepers to use the fogger. They include mixing instructions on how to mix oxalic acid for the fogger. Proper oxalic acid application for Varroa mite treatment does not harm your honey bees. It kills mites efficiently and does not seep into honey. Your honey bee colony will appreciate the relief from Varroa mites they get from this propane insect fogger. The fogger gives you effectiveness of treatment of 95% to 99% for the period of treatment you use on your beehives. It saves your bees from suffering the harmful effects of Varroa mite infestation. Varroa mites can wreak havoc in your beehive and lead to colony collapse. Both new and experienced beekeepers are better prepared if they note early Varroa mite infestations. Have you ever used the Varomorus Propane Insect Fogger before? Leave a comment below and let us know what you think of it.